Broadway actress Myrtle Gordon (Gena Rowlands) rehearses for her latest play about a woman in denial at the onset of her autumn years. When Myrtle witnesses the accidental death of an adoring young fan, it catalyses a crisis of confidence in both her professional and her personal life and threatens to undermine the whole production. 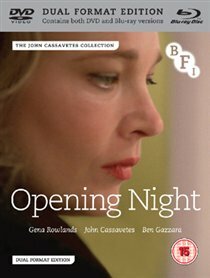 Featuring a startling and compelling performance by Gena Rowlands, which won her the Silver Bear for Best Actress in 1978, Opening Night is arguably one of John Cassavetes most self-reflexive works and offers an insightful and intriguing evocation of the theatrical experience from both sides of the proscenium.